The Jurassic Period is the second phase of the Mesozoic era and quite possibly the most interesting. It spanned a total time period of around 65 million years and started around 205 million years ago right up to about 135 million years ago. It was named after the Jura mountains which are located between the border of Switzerland and France for the simple reason that the first rocks of the jurassic period were found and studied there. Although the super continent had started to show signs of splitting in the latter part of the Triassic it didn’t actually split until the middle of the Jurassic period around 180 million years ago. The initial split left 2 continents a northern part called Laurasia (mainly North America and Europe) and a southern part called Gondwana (mainly South America, Africa, Australia). Throughout the Jurassic and the rest of the Mesozoic era these continents continued to drift apart causing the formation of new oceans and the flooding of many parts of these once arid and super dry central regions. All this extra water meant that deserts and previously uninhabitable regions were slowly turning into swamps and tropical forests which would change the face of the Earth forever. The above mentioned splitting and major break up of the super continent created not only a fresh new tropical environment for the next generation of dinosaurs but one that was greener and richer in plant life. The Jurassic weather was warm and the dampness provided by the early ocean exposure ensured that topical forests and plant life was plentiful. Forests of ferns, seed ferns, ginkgoes, cycads and conifers were common and the first flowering plants also started to appear later in the Jurassic. This was indeed a fine time for plant life and one that would form the foundation for modern day angiosperms. 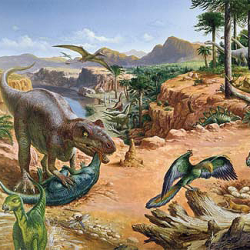 The Jurassic Period was called the “Age of the Ruling Reptiles”. Unlike the Triassic period, dinosaurs were now much larger which clearly put them at the top of the food chain. These extra large reptiles were the dominating species now and the Jurassic period marked their golden years. Some of the largest dinosaurs of the Jurassic were the herbivore plant eating sauropods. Thanks to the abundant plant life massive herbivores such as the Brachiosaurus, Diplodocus and Apatosaurus had no shortage of food and enjoyed a level of comfort not previously enjoyed by the Triassic dinosaurs. Just like the terrestrial herbivores of the Jurassic the carnivores were also a lot larger than their Triassic counterparts. The fiercest of these were extremely large theropods like the Allosaurus and the Ceratosaurus. The Allosaurus was probably the top Jurassic Predator of its time and with the largest specimen coming in at a length of over 9 metres its prey was most likely the large herbivores such as the sauropods. As a quick reminder thanks to movies like Jurassic Park its a common misunderstanding that the Tyrannosaurus Rex also existed during the Jurassic period when in actual fact it came into existance much later in the Cretaceous period. Other dinosaurs that fall under this misconception include the Triceratops who also existed much later in the Cretaceous. Flying reptiles like the Pterosaurs were still the dominant air species but during the Jurassic we also find the appearance of the first primitive bird like species in the form of the Archaeopteryx. Despite having more in common with dinosaurs than modern day birds it was still the first feathered flying species and clearly an evoloutionary step towards the bird species. Jurassic marine reptiles consisted mainly of the plesiosaurs, ichthyosaurs, large marine crocodiles, variations of modern day sharks as well as cephalopods which are relatives of todays squid and octupuss species. Unlike the Triassic most of the land dinosaurs and reptile families that existed in the latter Jurassic period were also still in existance in the early Cretaceous. So unlike previous periods there were no mass extinction event that denoted the end of the Jurassic period.